Altadenablog welcomes its new sponsor, Altadenans for Quality Education, aka AUSD Now! It's very simple mathematics, according to Bruce Wasson, Altadena's predominantly low-income student academic efficiencies are usually 30-50 percentile points below their comparable peers -- and after elementary school, it gets even worse. Closing that gap means finding outstanding educators to do it, and 'If we don't change the hiring model, everything stays the same," Wasson says. The outstanding superintendents and teachers -- the ones with a real track record, the ones who can actually make change -- need to bring a different skill set than we've had in the past. Wasson, who is one of the chief petitioners for the petition to create an Altadena Unified School District, says that they're not trying to split from Pasadena Unified -- their purpose is to use best practices to close the achievement gap, and concentrate on Altadena schools where the gap is prominent. We encourage you to read their comprehensive website that tells about AFQE's goals and hopes and reasoning behind creating a separate school district. It also offers a wealth of resources, from print to video, on creating high-performing schools, and offers opportunities to sign or circulate the petition. 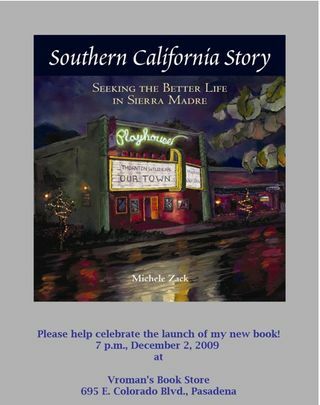 Altadena treasure Michele Zack, author of our town's authoritative history (Altadena: Between Wilderness and City) will premiere and sign her new history, Southern California Story: Seeking the Better Life in Sierra Madre on Wed., Dec. 2, at Vroman's Book Store in Pasadena. 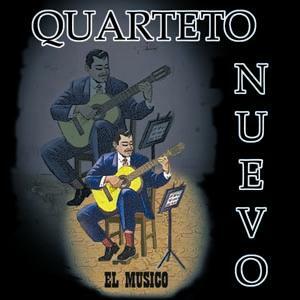 Quartetto Nuevo @ Altadena Community Church Fri.
World fusion group Quartetto Nuevo, will play at the Altadena Community Church, 943 E. Altadena Dr., this Friday at 8 PM. The percussion/guitar/cello/winds group plays a benefit for the church's roof repair fund. (We think they sound a little like Oregon, which was one of our favorite groups!) TIckets are $20 general/$10 students. "Overcoming Overeating" teleclass starts Tues. Raw food expert Revell Revati tells us she will start a 6-week "Overcoming Overeating" teleclass series free for the first 10 people who contact her -- normally a $267 value. Classes start tomorrow, Tues., Nov. 17, at 5 PM. Revell tells us it will be recorded and later sold on CD. For more information, please go to http://bit.ly/37LFWV. 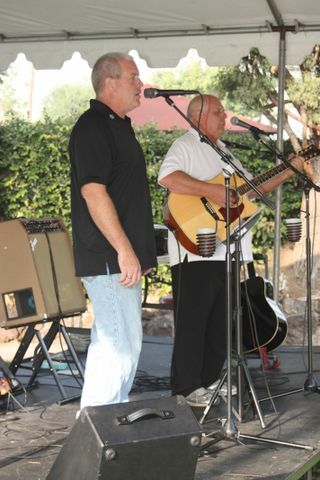 Another double-header weekend at the Altadena Library, 600 E. Mariposa, on Sat., Nov. 21. 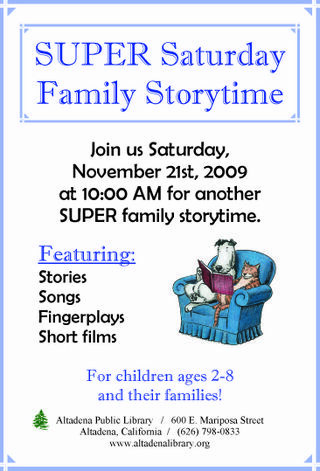 At 10 AM, it's Super Family Storytime for children ages 2-8 and their families, with stories, songs, fingerplays, and a short film. 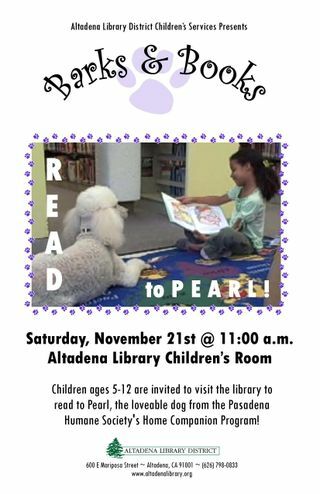 At 11 AM, it's "Barks and Books," where young readers can read aloud to Pearl, a lovable poodle and appreciative audience! The Altadena Library is offering an amnesty (kind of!) for your library fines for the holiday season! From Nov. 23 to Dec. 7, bring a new toy or non-perishable food item to the library clear some of your unpaid fines (schedule is on the poster). 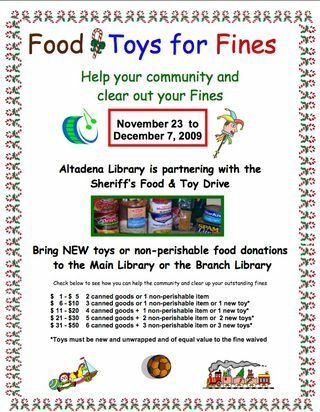 Items will be given to the Altadena Sheriff's Station for their annual food and toy drive. scissors.paper.rock salon offers girl's night out on Fri., Prism Wellness Sat. Scissors Paper Rock Salon (Altadenablog sponsor) will hold a "Holiday Shopping Extravaganza 'Girls Night Out' on Fri., Nov. 20, 5:30-9 PM. The event is Hosted by project 12/22, which is on Facebook. Clothing, jewelry, handbags, music, and (yay) cocktails! Lots of local men sing in this barbershop chorus, it's lots of fun and they are a really nice group of people. For more information call 626-286-0355. Opportunity Drawing Tickets $1.00, or (6) for $5.00. 11:00 AM - Barbecue - $6.00 (Includes burger or hot dog, chips, salad and a drink. This attachment seems appropriate to post on the blog in light of the conversation going on about businesses closing their doors. 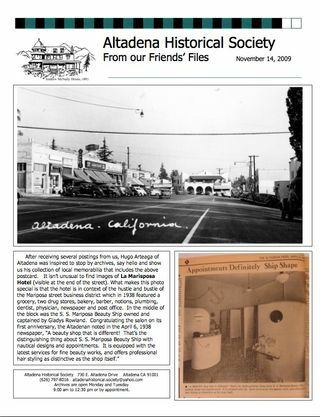 This is what Altadena used to look like, and if people shop local, it will again. ... at the Community Center, 730 E. Altadena Dr.
We have heard (unofficially at this time) that the closed meeting to consider recommendations of the investigation committee will be moved to next month -- so this may be an uneventful meeting after all. But one never knows. I posted the full USFS report, burn maps and several reports on debris flow, botany assessment, geological and hazard assessments to my website here (too large to send). From Mike McIntyre, USFS: .... "The area above the Chaney Trail Gate is a mix. We have basically closed the burned area till at least after winter for health and safety but the area east of Chaney Trail is open but Millard Campground and Millard Campground and Mt. Lowe Truck Trail and Sunset Ridge is closed. So you can walk on Chaney Road up to the Forest Boundary but everything west and north in the Forest is closed except to those with permits (like the Cabin owners). We are trying to see what is workable"
Summary of Baer Report: While many wildfires cause little damage to the land and pose few threats to fish, wildlife and people downstream, some fires create situations that require special efforts to prevent further problems after the fire. Loss of vegetation exposes soil to erosion; runoff may increase and cause flooding, sediments may move downstream and damage houses or fill reservoirs, and put endangered species and community water supplies at risk. The Forest Service Burned Area Emergency Response (BAER) program addresses these situations with the goal of protecting life, property, water quality, and deteriorated ecosystems from further damage after the fire is out. Next weekend, Saturday Nov. 21 & 22, 8 - 4pm, PUT THE FORK IN HUNGER -- Pasadena's Largest Food Drive ever will take place at the Fork-in-the Road at Pasadena & St. John Ave just south of Huntington Hospital. A variation on the behavior of some burglars has been reported. I don't know at this point in which part of Altadena the incident occurred, but at approximately 2:30 am on Wednesday morning, a resident was awakened by the sounds of a woman in distress at the front door. The woman at the door said she and her baby needed help. As the resident was talking to the woman through the door, a man was attempting entry at the rear of her home. If you have a similar experience, call the sheriff's station first and then holler through the door - "don't worry, I've called the sheriff for you." That has been a deterrent in some areas. Altadena Sheriff's Station - 626 798 1131. You can stop in at the Sheriff's Station and ask for stickers with the Sheriff's Station's phone number that you can put on your phone, so when something happens, you don't have to try to remember the number. It'll be on your phone. Sledding in Altadena? In the snow? That must mean the Altadena Arts Coalition is at it again! On Sat., Dec. 12, Galloway Alley (behind Altadena Hardware) will again be the center of action as the Coalition hosts the North Lake Pole Holiday Shop-Hop Festival from 6-11 PM. Right now, sponsorships are still open at $50 for business or individuals, and $100 for organizations. They're also looking for donations for the raffle prizes. The sponsorship form is available here. (pdf document). To get on the list of participating merchants or for more information, call Ben at (626) 794-4888. PSN has a great editorial on Hahamonga Watershed Park issues. A tech website, TechZulu, has a rave review of L.A. Tech Week, which was recently held at the Business Technology Center. All that recent helicopter activity was the deputies trying to flush out the three men who beat and robbed a man at Fair Oaks and Mendocino at about 6:30 tonight. PSN's Brian Day already has a story in. Now we have to draw a bobcat! Just to add to our critter compendium, a large bobcat was in the ungroomed part of our large yard on Monday morning. As my yard man described it [a gato montez], it would seem to have been a male--about 2' tall, 3' long, good spots, big tufted ears, very short tail. I was sorry to have missed him, but my gardener couldn't reach me to tell me. Location, Crescent Dr. where Bowring tees into it. Bulgarini Gelato will take part in a Gift Boutique for the Wellness Community of Pasadena which provides for cancer support. 25% of all sales go to the Wellness Community. There will be many vendors selling a wide variety of items, including gelato certificates, jewelry, artwork, tree ornaments etc. Please stop by and get a head start on your holiday shopping!! What's on your mind this weekend? 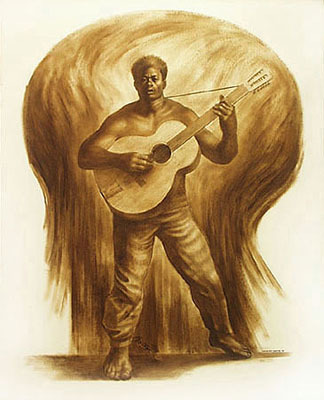 (Graphic: "Leadbelly" by Charles White). A depressing little story in the Pasadena Weekly by Andre Coleman and Justin Chapman, about the shuttered businesses on both ends of Lake Ave. We wonder, tho', why the Weekly quotes former town councilman Steve Lamb in two different stories this week -- was everyone else out of town? Let's start with the Pasadena Weekly's article on Herbert Simmons vs. the Town Council, with requisite alt-journalism inflammatory subhead ("star chamber!") and a "secret closed session" (which it wasn't -- it WAS a closed session, but there was no secret that it was being held -- a big difference that seems to elude the Weekly). And we are introduced to a recurring theme: that the Sheriff's Support Group is something like the Illuminati of Altadena. "The majority of the people on the council now belong to that group," they quote former councilmember Steve Lamb. We're checking on that statement, printed without qualification by the Weekly, and will tell you what we find out. Meanwhile, on Simmons' Altadenans website, the beleaguered councilmember is asking for help, calling it "A Call for Justice and Due Process !" A version of this was also emailed to Mr. Simmons' email list. Below is an e-mail, copied verbatim, from the Executive Committee of the Altadena Town Council [Note: it's not -- it's from the Investigating Committee, which is a different beast than the Executive Committee], received on Tuesday, November 10th, at 11:48am regarding the allegations against me. In a Cure and Correct letter dated September 18th, I requested this information in writing to be furnished within 30 days. Only now have I finally received the allegations in writing, many of which had been added after the original Closed Session Meeting on August 18, 2009, almost four months ago [Note: August 18 was less than three months ago, but you knew that]. Has this now become a country in which dissent from the majority equals death? Is freedom of speech no longer allowed? Hysteria much? Who is sharpening the headsman's axe? (Probably the Sheriff's Support Group.) And if anybody's quashing Mr. Simmons' freedom of speech, we're unaware of it -- there seems to be no end to the emails he sends out and additions to his website. Maybe he means his freedom of speech is quashed by asking him questions, because he's not keen on answering them (see below). Been several reports of sheriff's deputies looking for a white van or utility truck with two ladders that may be involved in at least one residential burglary. One of the unfortunate results, according to neighbors, was of a police chase followed by deputies hassling some legit gardeners matching that description in the Jaxine/Alzeda neighborhood earlier this week. On Wednesday morning, I spotted two guys walking north on Craig, just above Glen Canyon. I called the Sheriff and within five minutes, three patrol cars arrived. The two guys, and his boss, were legit; they were handing out cards, looking for tree-trimming work. More important, the Deputy, Mike Prince, said to be on the lookout for a van they suspect is involved in home burglaries. The white van has two ladders on the top, one red and the other silver. The van has doors on the side and the back, but no windows. "That way they can back into a driveway and load it up with no one knowing what's inside." See something suspicious? Call the Altadena sheriff's station at 798-1131. Altadena author Michelle Hunevan is interviewed in The Elegant Variation on her newest novel, Blame. Caltech-Occidental Concert Band, 8 PM, Ramo Auditorium, Caltech. Coffee Gallery Backstage: Bop Ensemble, with Bill Bourne and special guest Dan Janisch. 8 PM, tickets $15. Altadena: Heritage of Abundance energy efficiency workshop, at the Community Center, 9-11 AM. 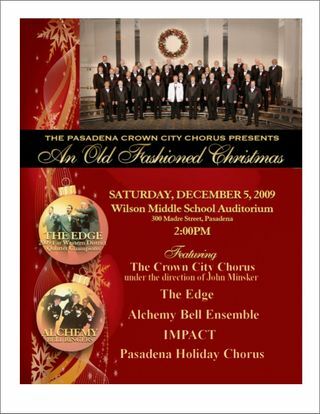 Free for Altadena Heritage members, $5 for others. Arroyo Food Co-op social, Yoga House in Pasadena, 11 W. State Street, 7:30 PM. Beverly Mickins, actor, writer, storyteller and singer at Altadena Junction, 8 PM, $10 cover, please RSVP. Down Syndrome Assn. 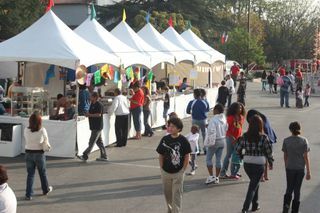 of LA annual Buddy Walk at Santa Anita Park in Arcadia, doors open 11 AM. PUSD will hold its 13th annual free parent summit at Marshall Fundamental Secondary School this Sat., Nov. 14. The summit, titled "Collective Wisdom," is a free day long event (7:30 AM-4 PM) with workshops for parents. Breakfast, lunch, childcare and translation (Spanish) will be available. Both full day and half day registration is available, and registrations forms are available at all PUSD schools. Click the graphic for more details. Tonight as I came home, i drove up the Chaney hill after locking the gate and passed our beloved neighbor Bonnie Callahan walking down the hill with her nosed buried in her book, as usual. I rounded the corner past Bonnie and about 50 yards later came upon a large female mountain lion. It was definitely following Bonnie. I scared it up onto the hillside, turned my car around and gave Bonnie a ride back to the gate. She safely scooted home from there. I turned my car back around and headed back up the hill where I ran into a really nice bunch of teenagers walking down the road. I warned them about the lion and they said they heard some kits (is that the plural of mountain lion babies?) down in the canyon on the opposite side of the road. Clearly, they belonged to Mama Stalker Kitty. Taking a bit of personal privilege for Veteran's Day -- found a collection of videos of dogs welcoming their masters home. (This is why we are a dog person!) Thank you, vets! And for those serving, come home safe! Sorry for late notice, but "Criminal Minds" fans might want to hop over to Palm between Olive and Glenrose. Must be big scene as took over lots of street parking. One day only shoot, scheduled to end11 pm. We heard they were doing some shooting around Chaney Trail today. Criminal Minds must love Altadena -- their 100th episode is schedule to broadcast this month, and they shot some interiors last month at Webster's Pharmacy. BTW, let us know if you ever spot film/TV shooting in your neighborhood -- we just love this kind of thing! No other nation has spent so much of its blood and treasure to keep other people free. Thank you all for your service. Don't forget that the Altadena Library has a tremendous program today at 7 PM. At PUSD, this is a dreaded "pupil-free day." Which means updates will be sporadic, if at all today! 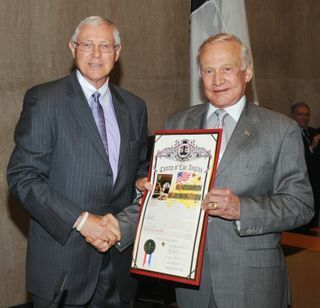 In recognition of the 40th Anniversary of Mankind’s first walk on the moon, Supervisor Michael D. Antonovich joined Apollo 11 Astronaut Buzz Aldrin in honoring the hundreds of men and women of NASA and 24 Apollo astronauts who served this nation in the armed forces, and helped advance this nation’s space program. Veterans played a vital role in every aspect of the Apollo program serving as flight controllers, engineers, back up crew members and as astronauts. Home to Edwards Air Force Base, JPL and aviation giants Lockheed and Boeing, Los Angeles County continues to play a vital role in our nation’s space program with dedicated professionals in science and engineering pushing the boundaries of space flight technology. Last year, the Altadena Sheriff's station distributed food and toys to more than 200 families. This year, more families than ever are experiencing dire straits. If you are able and willing, you may drop off canned goods at the Altadena Sheriff's Station any time between now and December 15th. Toys for children from newborn to 15 years of age would also be very welcome. Small donations, large donations, or cash donations - even a dollar, can make an impact on helping meet the needs of our community. A reminder that the Altadena Chamber of Commerce's monthly mixer will be tonight, Nov. 11, at the Altadena Golf Course 10th Hole Bar; & Grill, 1456 E. Mendocino, 5:30-7 PM. For Chamber members, free admission includes a free raffle ticket for a grand raffle prize. Guest $7 admission, no-host bar, bring a raffle prize and receive free commercial time for your business. Veteran's Day is Wednesday, and the Altadena Senior Center at 560 E. Mariposa, already has the jump on honoring those who have served. 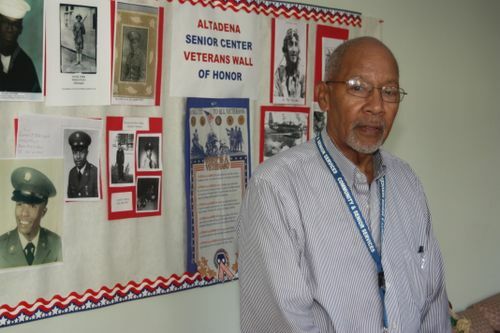 Senior Center staffer and veteran Landy Johnson has set up a "Veterans Wall of Honor" at the center, and wants to fill the wall with pictures and memorabilia of our local soldiers, sailors, airmen, and Marines. For more information, call the Senior Center at (626) 798-050. PSN today says that the National Federation of Independent Business has honored Mike Horner of Catalina Island Camps as the Western Region Solveras/NFIB Small Business Champion. Horner is president of both Catalina Island Camps and Tom Sawyer Camps, Inc., both headquartered in Altadena. Reader Nancy King just pointed out this story on the LA Times website -- the Station Fire is still smoldering in the root systems around Mt. Wilson, and they're bringing out more firefighters. This thing is harder to kill than Dracula. Nothing is ever black and white in Altadena, that's for sure! I am writing to recommend that the interpretive signs which have created a series of eyesores at the Cobb Estate for over a year now, be removed. Although no doubt well-intentioned, the plan to place them there there was not well thought through — nor do the signs honor the spirit Virgina Steele Scott's gift to our community. It says on the plaque at the entrance that this land is meant as a quiet sanctuary for birds and people forever. As Altadena's historian, I spent time researching this site, and sharing my findings in Altadena: Between Wilderness and City (pp191-192). 1. 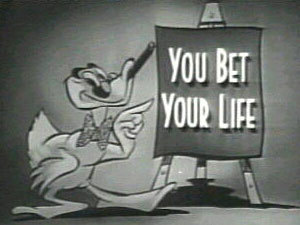 After Charles Cobb's death in 1939, the property changed hands many times, most famously when the Marx Bros. bought it in 1956. 4. When saved though efforts of John Muir Students, the Audubon Society, and mostly, a gift of $150,000 from Mrs. Virginia Steele Scott in 1971, the idea was to keep it as a passive area for birds, hikers, and others wishing to enjoy nature and access trails. Considering the site's history, you would think it a foregone conclusion that interpretive signs would become grafitti blackboards and a financial drain to whoever became responsible for maintaining them. In this case, no one seems responsible. The desecrated signs take away from the beauty of this sanctuary, not to mention making people scared to go there at dawn/dusk when it is very peaceful and a good time for observing wildlife. No one wants to run into gang members or other undesireables. I do not think it a prudent public expense to take responsibilty for cleaning them up continually, (it seems to take months and even years for volunteers to organize this activity, and in the meantime we have to look at messed up signs) and hope taxpayer money is not wasted on this fruitless endeavor. I believe the most reasonable long term solution is to take the signs out so hikers and other nature lovers may again enjoy this wonderful gift to the community in the way it was meant to be enjoyed: as a sanctuary. Sometimes generous-minded ideas simply do not work out, and the time comes to move on. Hopefully, better historical research will go into Audoban's next project. Thanks for your consideration on this, and I request to be kept informed on any county decision regarding these signs. 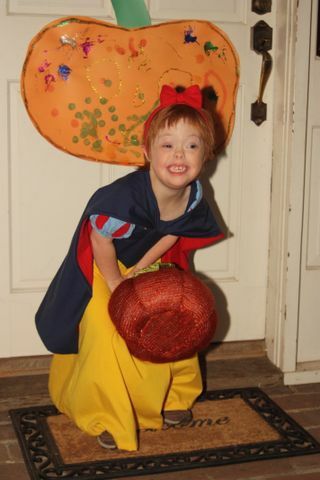 People with Down Syndrome are close to our heart (especially Rosie, pictured), and this week we're trying to wrap up our appeal to Altadenablog readers to help support our team. Rosie's Blue Lobsters will walk for the fifth year at the Down Syndrome Association of LA's annual Buddy Walk, our major fundraiser to help individuals with Down Syndrome and their families. The Buddy Walk will be at Santa Anita Park in Arcadia this Sun., Nov. 15, and you're invited to join our team (which is a lot of fun, not hard, and hey, you get a T-shirt!) or make a donation to support our walkers and people with Down Syndrome. Altadenablog readers are the greatest and most generous in the world, and we thank you for your support! Just click on the Blue Lobster's ad in the right column! From Mon. Nov. 9 until Tues., Nov. 24, Webster's Fine Stationers will be a drop-off location for the collection of food items donated to Five Acres for their annual Thanksgiving Food Drive. To provide some incentive, Webster's Fine Stationers is offering anyone who donates food items to Five Acres a 10% savings on their purchases. Simply give your food donation to one of the WFS Crew and they will give you a coupon for 10% off your next visit, or you may choose to use it right away! What could be better in these economic times than a win-win situation for everyone? We hope you'll choose to donate what you can this year to this very worthy Altadena non-profit. [State Assemblyman] Anthony Portantino's District Director Julianne Hines has completed the interview and selection process for a new field representative responsible for Pasadena/Altadena. Her name is Tanganica Turner and she can be reached at Tanganica.Turner@asm.ca.gov. Welcome, Tanganica! 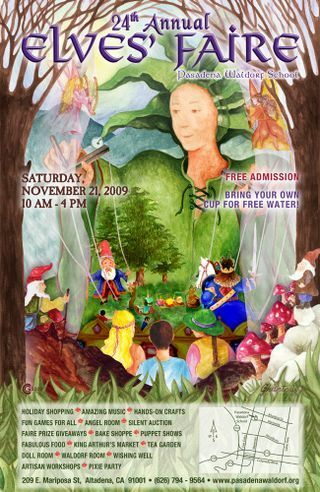 Arroyo Food Co-op Social Sat. Arroyo Food Co-op is excited to announce our first social event in Pasadena! This is a great chance to visit Yoga House and to get to know other community members interested in establishing a cooperative grocery store in our area! Please join us to enjoy light hors d’oeuvres and learn about the exciting progress that's been made by the Arroyo Food Co-op! Yoga House has generously donated a 5-class series to be given away to one lucky attendee at the event! When: November 14, 2009 – 7:30 p.m. to 9:30 p.m. Please scroll down for directions and important parking information. Consider carpooling as parking is limited. Reservations requested – please provide your name and the number of persons you wish to include in your reservation. Click here to email us your reservation. We could still use volunteer help for this event. Assistance with basic setup, food table and take down tasks would be much appreciated. No co-op experience necessary! If you’ve a mind to help, please let us know so we can look for you that day: Click here to let us know you're able to help out. If you have any questions about this event or would like further information about the Arroyo Food Co-op, please click here to contact us. Altadena Crest Trail meeting@ Community Center Tues. If you haven't been on the ACT lately, give it a try. All is beautiful, of course, as it was when I went running this afternoon down to Loma Alta Park. Perhaps because so much wildlife has been exiled from the mostly-barren (of food and forage) burn areas, there are more animal tracks than ever on our nearby trails. "Up," Disney/Pixar's hit from last summer, will be the Altadena Main Library's Friday Fun Flick on Fri., Nov. 20, starting at 3:30 PM at the library, 600 E. Mariposa. Admission is free! The Pasadena Audubon Society installed six nature trail signs at the Cobb Estate a while back, and they have been getting badly graffitied, to the point that a neighbor of the Cobb Estate asked us to remove them. For a variety of reasons, including the fact that we had spent a lot of time and money on the signs, we opted not to do that. Instead, we have been researching products with which to coat the signs to make them more resistant to graffiti (or at least more easily cleanable), and we have been working with the local sheriffs, the USFS, and Outward Bound to find some solutions. This process will start in January, once we have the signs cleaned and some other procedures in place with the Sheriffs and Forest Service. Thx to Ty Harman for the tip! St. Elizabeth of Hungary Roman Catholic Church is holding its annual Fiesta this weekend, and it looks like a good time was had by all. Who doesn't love a giant slide? Those Manning Boys offered an Irish musical treat. Booths, rides, and of course, food, kept people coming. We're a straight guy, but let us say this up front: Robert Wagner is an extraordinarily handsome man, even at age 79(!). 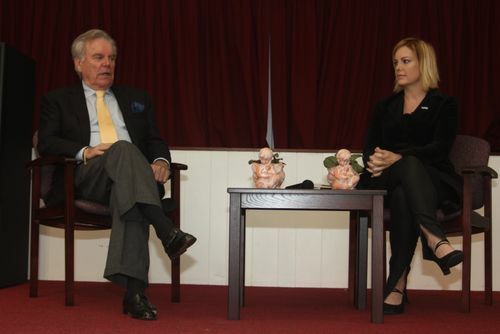 Saturday afternoon, with daughter Katie Wagner, he shared memories of the golden age of Hollywood and his storied career in film and television. 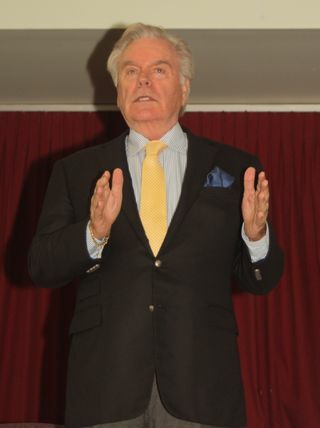 About 100 people attended the talk, where Wagner also autographed his memoir, Pieces of my Heart. Please join us..."Sunday at the salon!" If you are "growing out" or "going out" learn some new techniques to change your hair style for the holidays. Sunday, November 8th, 1:00 - 3:00 P.M.
Update 1 PM: this story is rewritten from an earlier version when news was still breaking. The Altadena Town Council's ethics committee voted last night to recommend to the entire body that councilman Herbert Simmons be ousted from office. 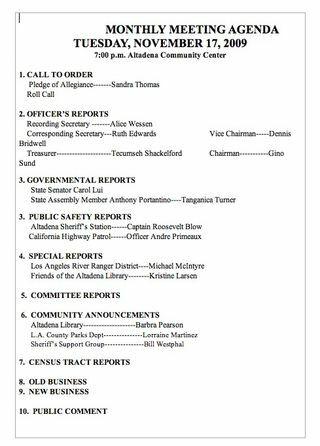 The committee charged with hearing the issues regarding your alleged violations of Altadena Town Council Bylaws and Ethics standards convened on [11/5/09] and voted in majority for your removal from the Altadena Town Council. Of eight designated members there were six in attendance constituting a quorum. Discussion and voting consumed two hours and forty three minutes commencing at 6pm. The committee meeting incorporated and weighed Roberts Rules of Order, Bylaws of ATC and ATC ethical standards. This vote is an advisory to the Town Council and not a finality of the matter. A two thirds quorum of Town Council members must now convene in a closed session hearing as to final disposition of this matter at a date and time to be determined by the Executive Committee. Your attendance is requested so that you may offer your rebuttal to these charges. On his website, Simmons fired back with: "It is now time for the community to step up, let your voices be heard, and demand answers." The ethics committee -- which has not until now even said publicly that it is investigating Simmons -- was convened to look into charges that Simmons was misrepresenting that the town council was participating in his private Student and Teacher of the Month awards. Simmons has said that it was a misunderstanding, altho' we have spoken to several business owners solicited by Simmons who said he made his membership on the council very clear and that that it was their understanding that it was a town council award. Simmons has previously admitted in an email that he was reprimanded by county supervisor Michael Antonovich's office for misrepresenting that the supervisor was also sponsoring his awards. The next step is for the council as a whole to consider the committee's recommendations, probably at its Nov. 17 regular meeting. Mickie Mills in today's PSN profiles Altadena still life artist Kathleen Swaydan, who will be in the Creative Arts Group show this weekend in Sierra Madre and McGinty's Gallery in December.